As the rainy season descends upon us, and the darkness begins to outweigh the light, what could be more important on our sweet island than to stay cozy? We can think of two enticing ways to enjoy these newly chilled evenings, and they both involve quince. Originating in the birthplace of humanity, the fertile crescent, quince is an ancient fruit. Spreading in popularity from Asia Minor to the balmy Mediterranean, it quickly became a favorite of the Greeks and the Romans. In the same family as apples and pears (genus Cydonia), and predating these popular cousins, quince was likely the fruit tempting Eve in the Garden of Eden and the gift Paris gave to the goddess of love herself, Aphrodite. The Greek wedding gift of choice, young brides were said to have nibbled the fruit before they entered their marriage chamber to sweeten their kisses. 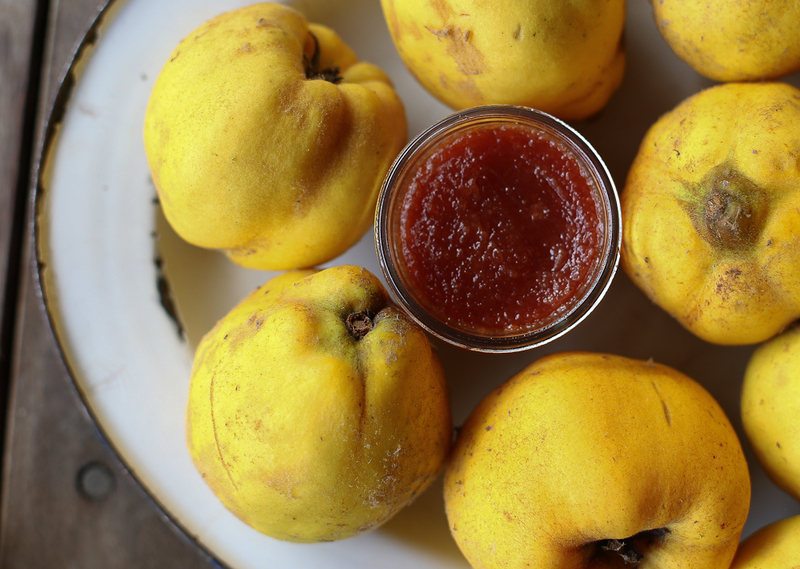 It's no wonder with its plump form and succulent smell that quince became associated with love and sensuality. Or perhaps it is the soft down fuzz that covers its ripe flesh -- begging for petting and caressing. Virtually inedible raw, Nigel Slater calls it, "the cooks fruit: one for the kitchen rather than the fruit bowl...". (Ripe, p, 436) And what a beautiful cook it can be, the golden ripe skin breaking down under heat and transforming into magnificent crimson -- like a blushing bride flushed with excitement. But why stop there? Ever heard of the Marmalade Madames? If you've ever found yourself wandering through the red light district of seventeenth century London, you'll know that these ladies of the night were aptly named by the aphrodisiac fruit itself. Where do you think Christina and “Lady Marmalade” got their know how? "Voulez-vous coucher avec moi (ce soir)?" anyone? From the Portuguese word for quince, "marmello", marmalade was originally made from the juice, skins and fruit of quince. Working with its high levels of naturally occurring pectin, the ancients cleverly noticed that drenching whole quince in honey and applying heat would develop a delicious and firm 'set'. Viola, the birth of marmalade - long before the California orange. 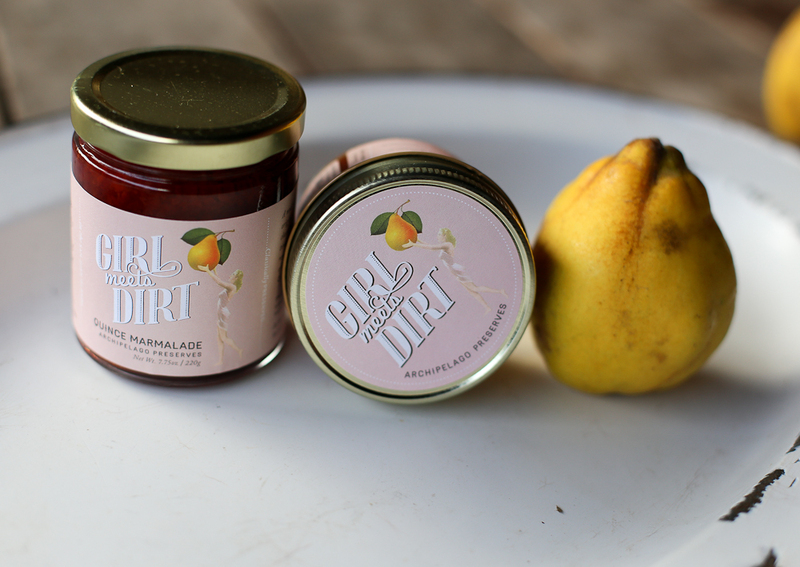 Continuing the tradition, this year's batch of Girl Meet's Dirt's handmade, island grown, Quince Marmalade is juicier than ever and beautifully bright red to boot! Sweetened within its own juices and packed with vitamin C, it's the perfect remedy for the winter blues. It is positively delightful as a topping on toast or folded into a buttery tart shell. But we love it on Manchego, Cheddar, Idiazabal, or any triple-creme for a guest worthy spread (delice de Bourgogne for a special treat). All those fans of our Quince Cutting Preserve will be thrilled to see it back in stock and ready for spreading on your holiday cheese boards. Hello holiday entertaining season! We recommend quince with aged Manchego (quince love’s sheep’s milk! ), Beecher’s Flagship Cheddar, Parmigiano Reggiano, or Glendale Shepherd's Woodsman aged hard sheep's milk cheese (on Whidbey Island). Whatever way you choose to stay cozy this winter, may we recommend enjoying it with a side of quince? It will leave you blushing with delight.